New to the Second Edition: offers the latest developments in standards activities (JPEG-LS, MPEG-4, MPEG-7, and H.263) provides a comprehensive review of recent activities on multimedia enhanced processors, multimedia coprocessors, and dedicated processors, including examples from industry. Image and Video Compression Standards: Algorithms and Architectures, Second Edition presents an introduction to the algorithms and architectures that form the underpinnings of the image and video compressions standards, including JPEG (compression of still-images), H.261 and H.263 (video teleconferencing), and MPEG-1 and MPEG-2 (video storage and broadcasting). The next generation of audiovisual coding standards, such as MPEG-4 and MPEG-7, are also briefly described. In addition, the book covers the MPEG and Dolby AC-3 audio coding standards and emerging techniques for image and video compression, such as those based on wavelets and vector quantization. Image and Video Compression Standards: Algorithms and Architectures, Second Edition emphasizes the foundations of these standards; namely, techniques such as predictive coding, transform-based coding such as the discrete cosine transform (DCT), motion estimation, motion compensation, and entropy coding, as well as how they are applied in the standards. 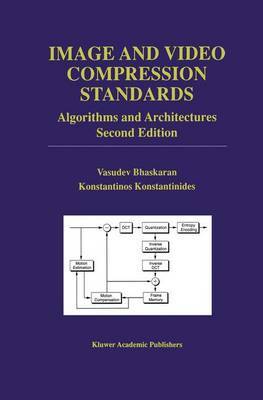 The implementation details of each standard are avoided; however, the book provides all the material necessary to understand the workings of each of the compression standards, including information that can be used by the reader to evaluate the efficiency of various software and hardware implementations conforming to these standards. Particular emphasis is placed on those algorithms and architectures that have been found to be useful in practical software or hardware implementations. Image and Video Compression Standards: Algorithms and Architectures, Second Edition uniquely covers all major standards (JPEG, MPEG-1, MPEG-2, MPEG-4, H.261, H.263) in a simple and tutorial manner, while fully addressing the architectural considerations involved when implementing these standards. As such, it serves as a valuable reference for the graduate student, researcher or engineer. The book is also used frequently as a text for courses on the subject, in both academic and professional settings.